John Adams during a Discover the Past tour of Chinatown. Sue Frause photo. One of my favorite ways to see a city is by going on a walking tour. But the tours are only as good as the guides, and John Adams of Discover the Past in Victoria is one of the best. This historian knows his stuff, presenting it in an entertaining and engaging way. 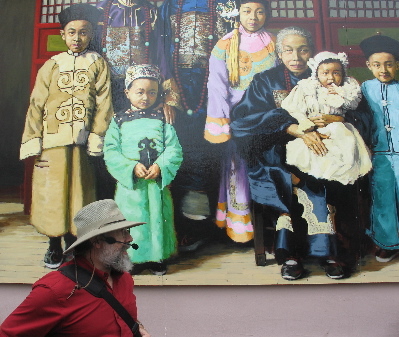 His walking tour menu includes ghostly walks, neighborhood walks and Chinatown. I went on the 90-minute Chinatown tour and learned a lot about this provincial capital. Did you know that Victoria's Chinatown is the oldest Chinatown in Canada? If you do take the tour, make sure you save time to have lunch at one of the restaurants in Chinatown. John will steer you in the right direction.